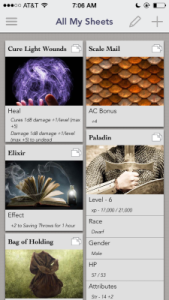 There are numerous RPG-related apps for rules reference, character development and management, etc. available, although most seem to be for Pathfinder and the like, rather than OSR-focused games. The only OSR-focused one I’ve used until now is Purple Sorcerer’s Crawler’s Companion, a very useful as well as well-maintained and updated app. Today I’ll be taking a look at SparkNET’s Sheet Yourself, a system-neutral app to create and manage characters as well as spells, abilities, weapons, or pretty much anything else you’d need to keep track of. 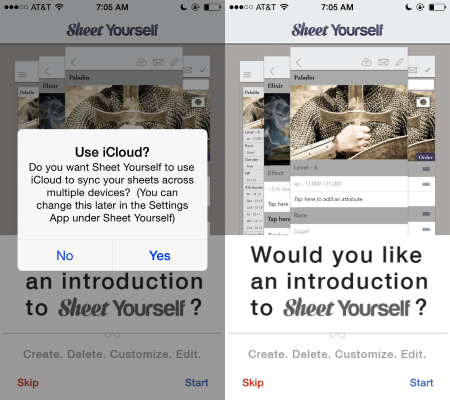 When you first open the app, you’ll be prompted if you want to use iCloud to backup/sync your sheets. Next there is prompt for a short video that highlights the app’s features. At four and a half minutes it’s not terribly long, but you may want to skip and dive right into the app. The video can always be accessed in the app’s menu. By default you’ll see a couple entries, one of each type of common things you’d likely create and want to keep track of in a game. You can tap on any of these to quickly see what information is shown for each sheet. If you only want to view one category of items, you can tap the menu icon at the upper left and then tap which category to view. Slightly confusing is that in this menu there is a Menu button at the top; tapping this brings up the option to view the intro video, access SparkNet’s social media, and view your iCloud backups. This is also where you’ll add any new sheet types or campaigns by tapping the “+” at the upper right. What’s nice about this app is that it’s truly system-neutral. It doesn’t assume you’re playing any specific game, and you can literally type in anything you want. This is also its downfall, as you’ll first have to type in everything. 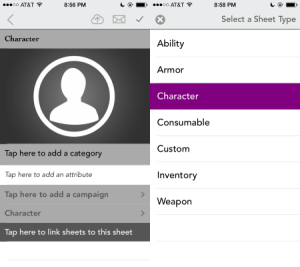 You’ll spend a lot more time setting up everything you’d need for your game(s), but once in you can easily re-use those items for any sheet in the app. To create a new item you’ll tap the “+” at the upper right. By default it will set it as a Character type; to change this you’ll have to tap “Character”, the second-from-the-bottom button; this is kind of confusing, as I would think the type should be under/over the name at the top. Related is the naming; by default the name is also “Character”; for those new to the program you may think this is where the sheet type is set, rather than actually the name of this sheet/item. If you want an image, you can tap the person icon (shouldn’t it be a generic photo/camera icon since you can set an image for a weapon, spell, or anything else as well?) to either choose an image or take one with your camera. Once you set an image however, you can’t remove it, only choose a new one. You can also link the sheet to an existing campaign here. However once you link to a campaign there’s no option to un-link it (at least as far as I could tell); so if you need the sheet un-linked you’ll have to duplicate it and then delete the original. If you need to email the sheet you can use the email icon at the upper right; it will compose an email with the sheet as an attachment (as a file with a .sheet extension); the email text provides links to the Sheet Yourself program on both iOS and Android. 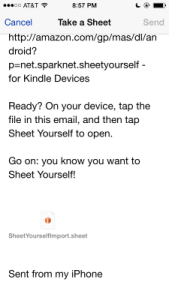 As a test I sent this email to myself to see if the file could be read with a text editor, but unfortunately it can’t be; so if you need your sheets and possibly hours of typing accessible outside of the program you’re out of luck. As mentioned above, you’ll have to type in everything, at least at first. Luckily there is a duplicate/copy option, although it isn’t obvious. On the main screen, tap the pages icon at the upper right corner of the item you want to duplicate; you’ll be prompted and then tap “Yes” to duplicate the item; it’s a true duplicate, even in name (I do wish it’d add “2” or “copy” at the end of the name), so you’ll need to edit that first just to know which one you’re working on and don’t accidentally edit your original sheet. At least the duplicated item won’t be linked to any campaign if the original item was. If you need to delete one or more sheets you’ll need to do it from the main screen by tapping the Pencil icon at the upper right. Be sure you really want to delete something, because once you tap the Skull & Crossbones icon on a sheet it’s deleted, no confirmation asked! In general I’m not too big on relying on technology for my RPGs (beyond PDFs on a tablet), however like any aspect of technology I can see where this app can be convenient as well as a possible hindrance. 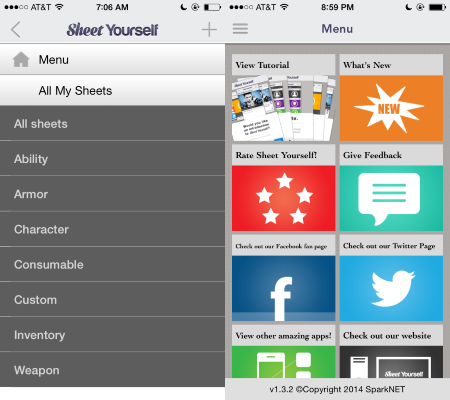 As there’s no free version of Sheet Yourself nor any way to demo it I can’t tell you if it would be a helpful app or even a vital part of your game. I’ll be curious to see what future updates and fixes the app receives. 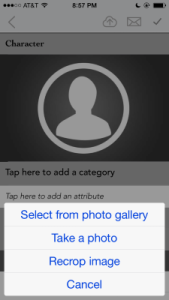 This entry was posted in Review on April 7, 2015 by James Lemon.